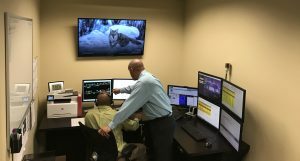 Rio Grande Pacific Dispatch provides reliable, around-the-clock primary and backup rail dispatching for 11 short line and commuter railroads, a task that covers approximately 2,000 miles of main track throughout the United States. RGP Dispatch is located adjacent to parent company Rio Grande Pacific‘s corporate headquarters in Fort Worth, Texas. The rail dispatching center operates 24 hours a day, seven days a week. Currently, RGP Dispatch supports more than 1,100 crew starts, while typically issuing over 1,800 Track Warrants and 200 bulletins on a monthly basis. Current railroad dispatching clients include RGPC rail operations in Louisiana, Oregon, Nebraska, Oklahoma and Texas. Additional short line clients include the DMVW Railroad, Mississippi Export Railroad, Dakota Southern, Natchez Railway, Texas Pacifico, Southwestern Railroad, Cimarron Valley Railroad, Washington and Idaho Railway and Denton County Transportation Authority (DCTA) A-train.